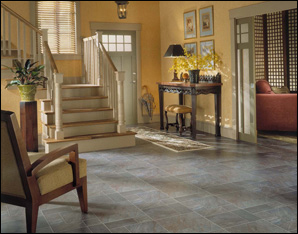 Regardless, when it comes to laminate floor styles, there are many to choose from. And if laminate interests you, it’s virtually guaranteed you’ll find one that suits you -- a style that’s the right solution for the way you live. This section explains laminate styles, and offers you all the information you need to make smart choices for you and your home. So read on shopper, and we promise to be as clear and helpful as possible. Fake has gone out of style. Laminates have truly come a long way. Why, you may ask? Photography makes laminate true to life. The more screens a product has, the more variation it can offer. And the more “authentic” the laminate looks. That seems to make sense, right? Color is your key, shopper. They come in a variety of laminate and wood designs and colorations, as well as some manufacturers offer a real, hardwood veneer instead of a printed layer. It looks amazingly hardwood-like. 2) Laminate flooring with attached underlay. 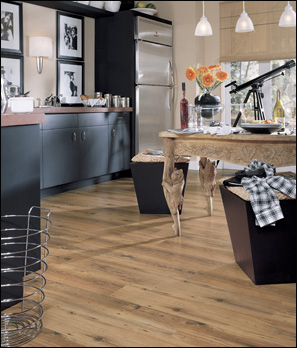 These floors come with several different types of tongue and grooved locking systems and an attached underlayment to reduce noise levels. Now that’s sound thinking! Finish off your creation with moldings. 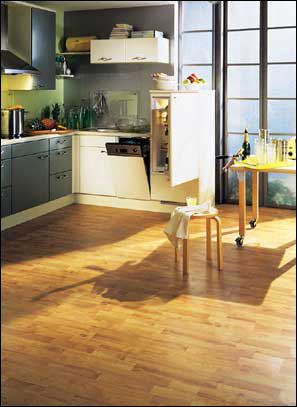 However, be aware that moldings for laminates are slightly larger than their wood or laminate tile counterparts. Here, to familiarize you with some standard moldings, are some definitions. 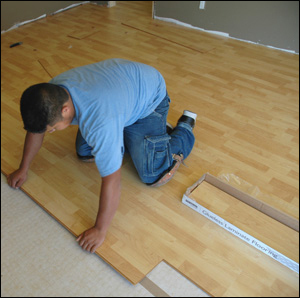 A Reducer Strip is the transitional piece the installers use to connect the laminate with another type of floor covering such as vinyl, thin laminate tile, or low-pile carpeting. An End Molding or Carpet Reducer is used as a transition from laminate floors to different flooring surfaces when the reducer does not allow enough height, such as on high-pile carpet or thick laminate tile. We recommend that you work closely with your retailer to become familiar with the moldings and transition pieces. With a lot of knowledge, hopefully from the above, and a little imagination (that’s your department), you can create a laminate flooring style solution for the way you live, and the way you feel about your home life. wooden Laminate flooring is a superb choice because, quite simply, no other type of floor covering comes close to providing you with such a wide variety of options.